Prince Ndoyi known for criticising the UPND and its leader Hakainde Hichilema lamented that the lives of most young people in politics is not reflective of the sacrifices they make to ensure their leaders remain where they are today. 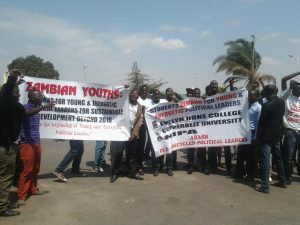 Ndoyi who said he first got interested in politics after meeting and shaking MMD founder President Frederick Chiluba’s hand at an event where he read a poem on behalf of his school in Ndola for the late Republican President, observed that young people are put in the pockets of their leaders after being used and that greed and selfishness has connived to oppress young people. Ironically Ndoyi walks in the corridors of power as seen from his posts on his facebook page dining and wining with the powers that be as well as his endless defence of the ruling PF even when he is MMD. Does this revelation reveal a glaring reality of what most young people close to the powers that be are going through owing to similar bitter comments from the likes of Ephraim Shakafuswa, Max Chongu, Brain Hapunda and Venny Kabamba. Below is his latest posting on Facebook. I shook the hands of Dr Frederick Chiluba when I was a child in primary in Ndola at the launch of the Polio Vaccination Week. I read a poem for him on behalf of my school, as he read his speech he said there is our future politicians and presidents. Since then I have pursued the frontiers of politics. Years back young people ascended to leadership positions with ease, but today, the narrative is different, the older politicians have blocked us from reaching the hilt of the mountain top. Greed, selfishness and self preservation among our political leaders have connived to oppress us who are the majority. The jokes and laughter I have shared, the things and secrets I have known and kept with those that bewilder power is a smear contradiction of how we live today. Coming to promises, I have at a personal level, met Edgar Lungu twice, Michael Sata and Rupiah Banda countless times, Ministers of whom some we have shared an acquaintanceship beyond politics even in their difficult times politically. And many youths like me have done the same, but today have been relegated to the terraces of real empowerment. A majority lot of those with power and influence are people we personally know, but have chosen to pretend. The young people will also pretend on that rainy day. Young people in politics are like a virgin, whose virginity is broken by an old grumpy married thug. Our conscience is raped, but we are told to keep quite, to keep the secret to maintain a status quo not beneficial to us. The young people toil and break their backs to keep the guys up there where they are. Some of our leaders are only loyal to their bellies and families. This attitude tells you what kind of society we are living in. I am persuaded to think we must but disappoint some of these disdaining greedy politicians. The bottom line I have noted without fear nor favor, that the old generation are afraid of young people, they would rather keep us in their pockets to unleash for their rainy day. Prince Ndoyi: Get a career first as politics is supposed to be a part-time engagement. It costs money to communicate, travel and entertain in advancement of political goals. What money do you make out of being constituency chairman of whatever political party you belong to? Nothing really, if you are an honest person. The dishonest of course use that to supply “air” to local public bodies like councils and get paid for it.